It has been too long between posts so I wanted to let all y’all know that I am still kicking and busy. Well, for a couple of weeks I was busy relaxing in Los Osos California “braving” the chilly 52 degree F mornings as my garden and friends back in Houston were sweltering. Damn, I had to put long sleeves on, slept with the window open under a comforter….wow, I could get used to this. All good things are subject to change….I had to pack up and return to Houston. Upon my return my cucumbers had succumbed to the heat and the white flies, yes, I knew it would happen. 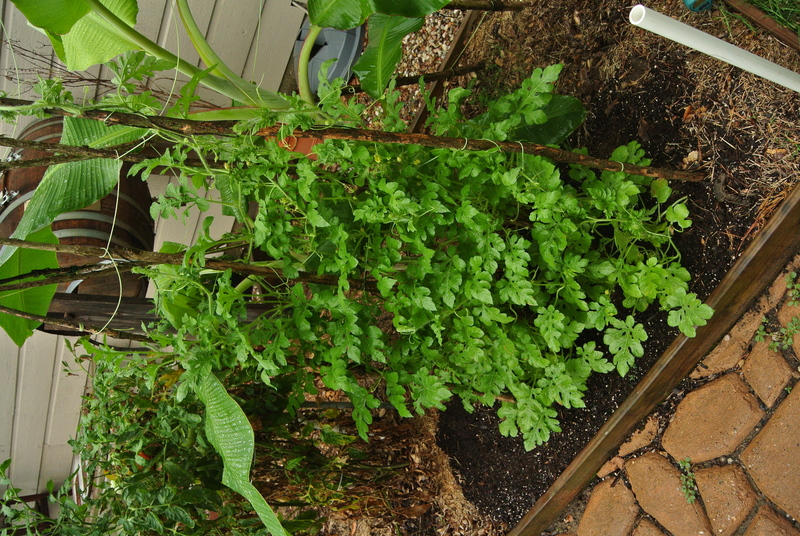 A couple of the tomato plants had also passed away…RIP….But they were making way for an August planting to provide good veggies into the Fall. I will replant! Cucumbers are going int first. I will load the bed up with compost and plant a couple of varieties. The English cukes did really well this year so more of them and then a bunch of Straight 8 variety. The local honeybees love visiting my Cukes! August appears to about normal in term of temperature and maybe a bit more damp than normal so it should be good. With my tomatoes, I may try an heirloom or two. Get them established while it is warm and hopefully enjoy the cooler temperatures going into the fall. Pink Brandywine and Cherokee Purple will be high on the list. So, no lettuce in my summer garden so I had to sub for it! English cucumbers made a nice and flavorful replacement. 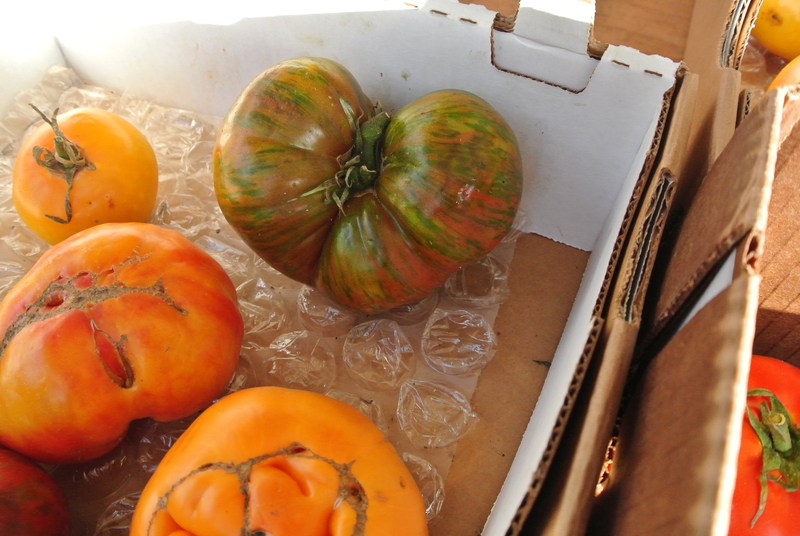 For the tomato portion of the sandwich I sliced up a ripe Brandywine heirloom variety. Yummy so far. I also have a bit of homemade involved with the bacon. 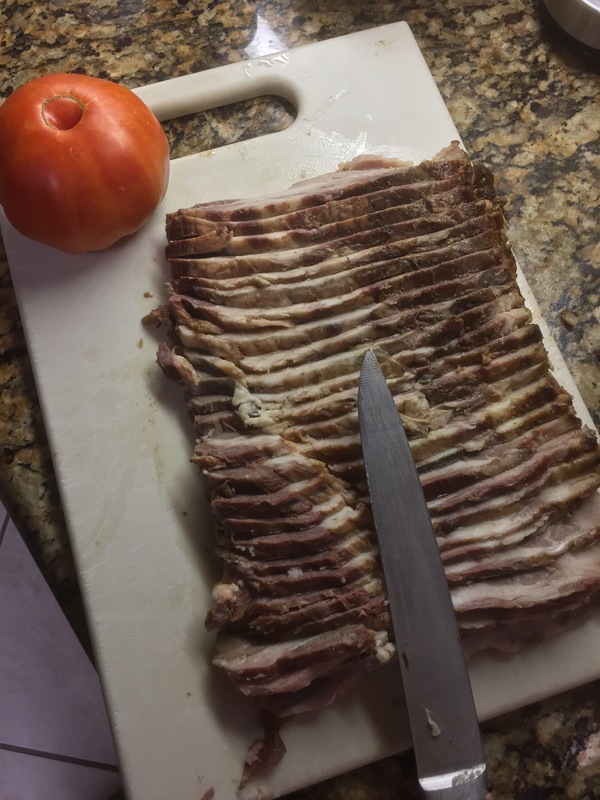 The bacon is lamb bacon, cured and smoked in my backyard/kitchen. I had just finished slicing it up, making it ready for packaging. I have another whole one in the freezer waiting for Fall recipes. 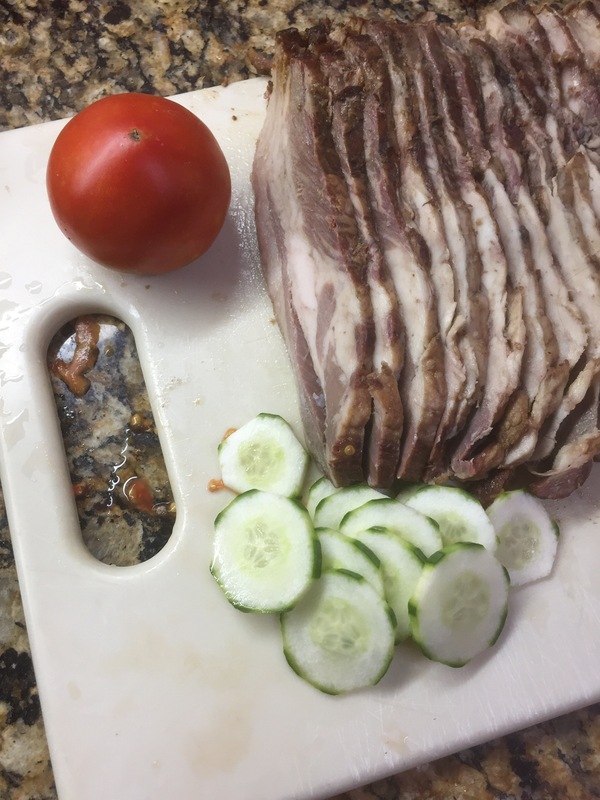 Each lamb breast used for the bacon recipe is about 3.5 pounds. The flavor is just amazing! Posing with the cucumber and lamb bacon is another variety of tomato that handles the Houston summers pretty well, Celebrity. The bees are also keeping me busy this summer. I am off to Navasota to pick-up five new queens. The queen’s in my two captured swarms are not laying well and will need to be replaced. I have, what should have been a new queen this spring, that is not laying well, so, down the road she goes. The last two will replace two older queens. It will be hotter than Hades tomorrow, requiring a beer or two to cope with the heat. I have some of my Honey Blonde Ale on tap to stave off my thirst. Bee season will slow down a bit later on then, time to brew more beer. No rest for the wicked! 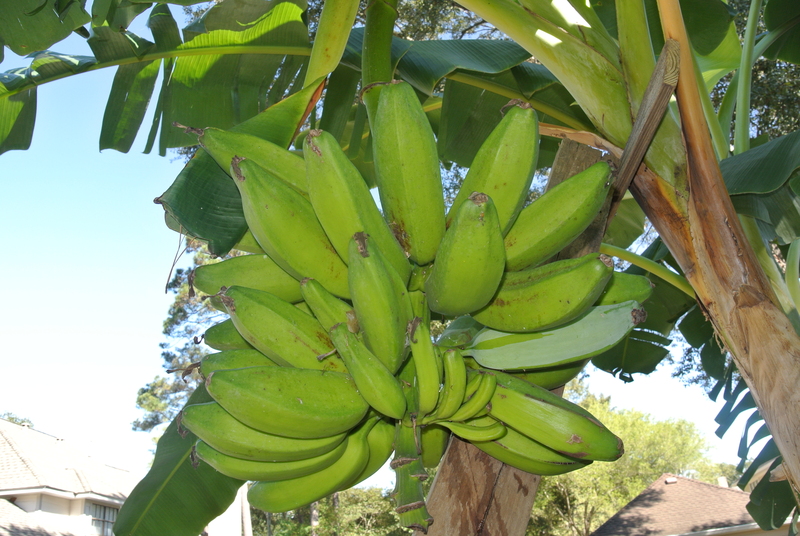 The surprise success with plantings this year has been the banana “plant”….. Not really a tree but most folks refer to them as trees. This was the second year after panting the first corms. 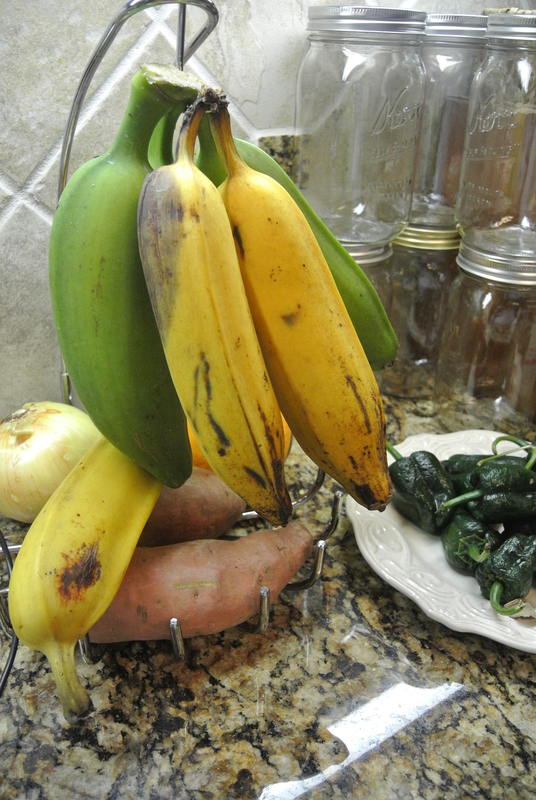 I was given one that should have produced “Manzano” bananas but has yet to fruit. The other was a mystery….If Marcelino’s father told me I must have not understood or heard. The unknown variety has produced a very nice large bunch and along the way I learned a lot about the growth habits of bananas. An internet search leads me to believe that the bananas are “Pera”. Once the plant matures a stem growing inside the pseudostem (trunk for lack of a better term) emerges from the top. As it curls downward it has what looks like a purplish heart looking bulb, an “inflorescence”. Looks like tightly wrapped paired leaves. 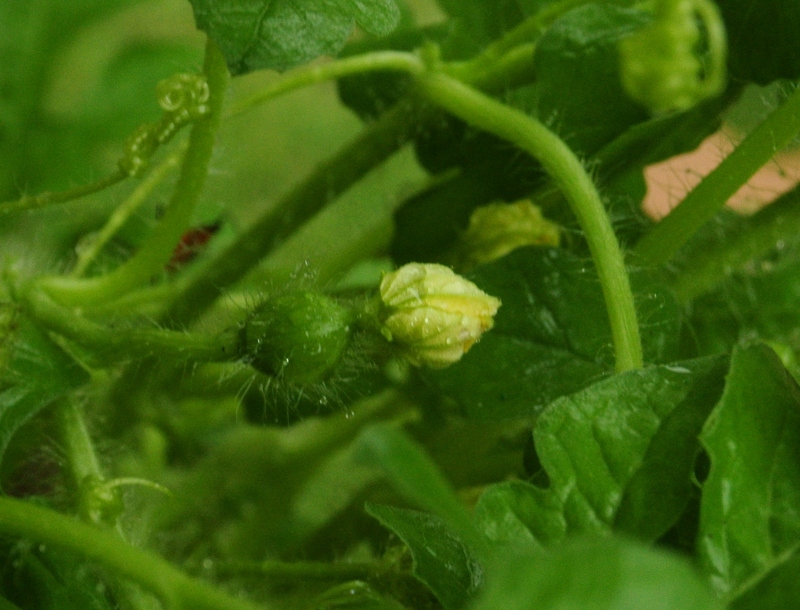 Female flowers beginning to expand. “A stem develops which grows up inside the pseudostem, carrying the immature inflorescence until eventually it emerges at the top. Each pseudostem normally produces a single inflorescence, also known as the “banana heart”. https://en.wikipedia.org/wiki/Banana#CITEREFStoverSimmonds1987. It was interesting watching the top two leaves open up and expose the flowers. The first that are exposed are the female flowers that develop into fruit. 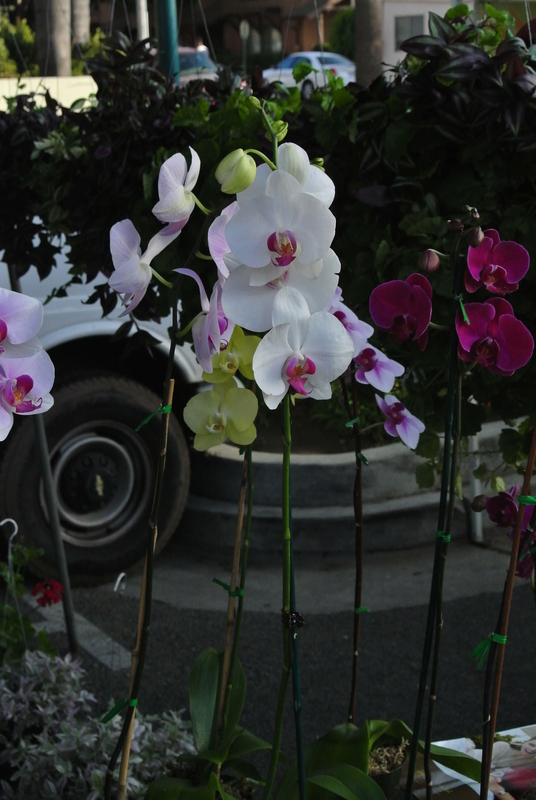 Each time the purple leaves open it exposes another tier of flower bracts. 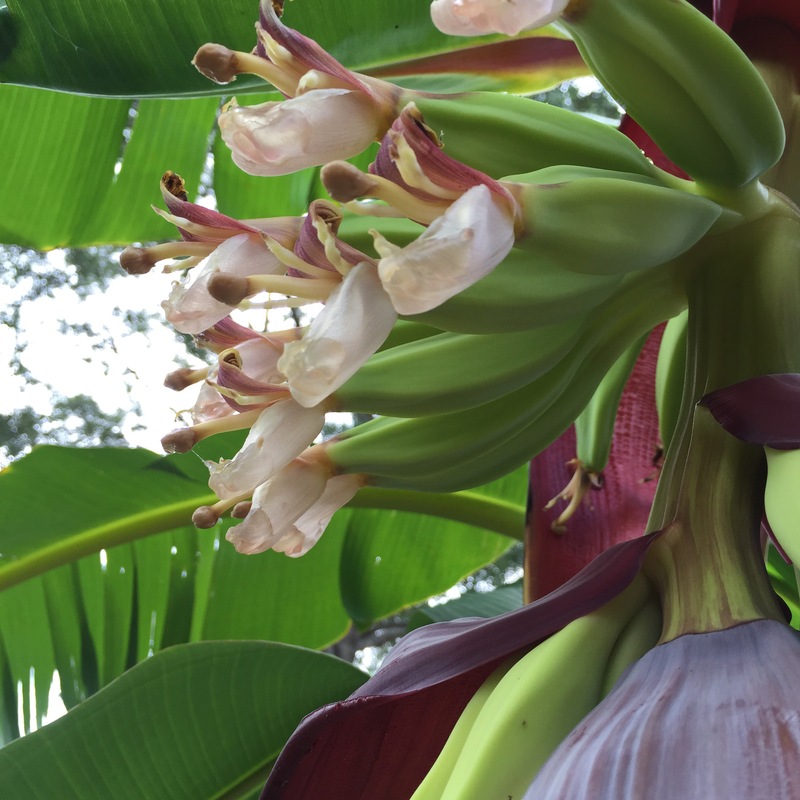 As the bananas fill in, maybe 8 to as many as 20 tiers the heart now begins to produce male flowers that appear to be useless….once they appear, they dry up and drop off. At first I thought I had a problem but learned that was normal. My hanging banana storage in the garden. Once the banana has plumped up nicely and doesn’t seem to be enlarging I have been whacking off three or four at a time and allowing them to ripen indoors. They will stay nicely on the plant until the weather turns cold. After that I will cut the entire stalk and hang it in the garage to ripen slowly. 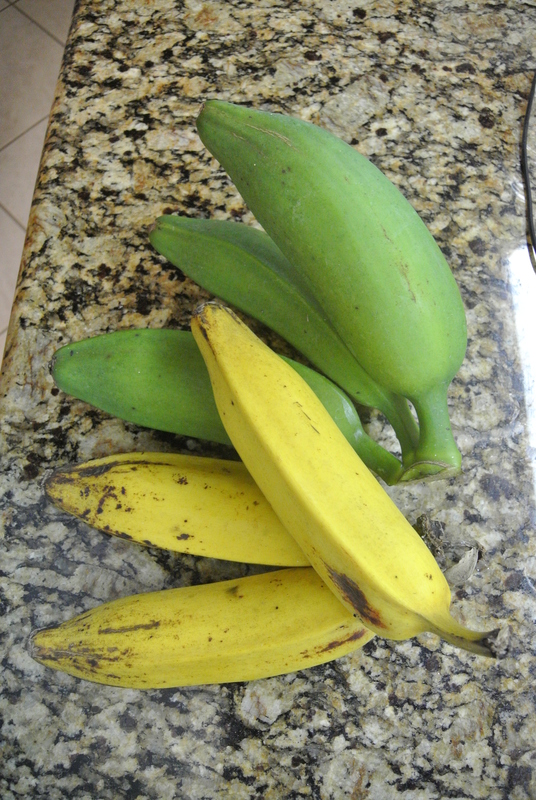 Several ripe ones with the most recently cut. Gardening activities have included building up a raised bed by adding more compost and mounding it up for planting strawberries. The cucumbers are done but the dang asparagus keeps sending up new shoots, not many but enough to snack on while weeding. 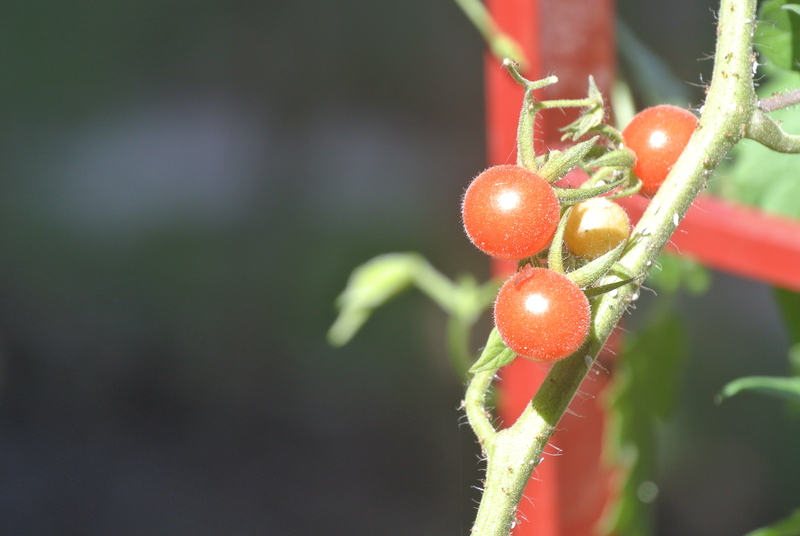 The Matt’s Wild Cherry tomato plant has begun producing again….they are small but tasty….pea sized to a little less than cherry sized. My Poblano pepper plant is churning out tons of dark green peppers. The beginnings of my fall strawberry planting’s. I will ad at least 50 more plants. Teeny tiny Matt’s Wild Cherry tomatoes. Hmmm – the beginning of some green beans….they better hurry – the air is cooling. My bees are now residing elsewhere but I am making more local contacts that are willing to host hives for me. I have a home for the top bar hives about 5 minutes from my house – Yee Haw. The productive Langstroth is too far away but it is in a good home. I am aiming for 10-12 hives next year and possibly 20 the year following. 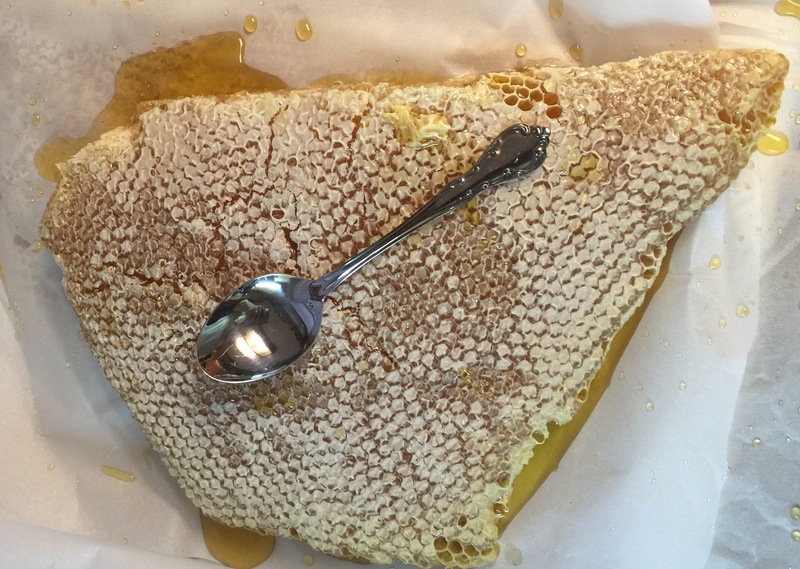 The new Texas regulations allow me to sell at Farmers Markets now….as long as I do not exceed 2500 pounds per year….that is a lot of honey! This will give you an idea how big the slabs of comb are. This one had an ear on the left hand side broke off. Side note; I bottled the Honey Blonde Ale a few nights ago…..made with MY honey. It will be awesome! The color was perfect, a hint of honey flavor but not too sweet. I do believe that I am a 6 year old trapped in the body of a 63 year old man. We have had a couple of good downpours today – I wish I could send some to my California friends – mixed with gentle sprinkles. During one of the misty lulls I went out to the garden inspect and snack…. Inspecting how the bees were doing, I am happy to report that they are doing very well. Here is where the curiosities of a 6 year old kick in. I stand off to the side of the take off and landing pattern. I marvel at the roles visible at the entrance….some bees just hang out there as guard bees preventing “robbers” from getting in and fanning at the entrance to help maintain proper hive temperature. The others that were zooming in and out are the foragers, the last period of a worker bee’s life. They are on a mission! When they arrive at the entrance from a foraging flight, it is all business and they disappear inside immediately. The foragers departing don’t display quite the same sense of urgency…. some wander around for a few moments…possibly checking out the proposed flight plan and then off they go. Others, the hesitation is very brief and then off they go. I feel such a sense of wonder, almost mesmerized, as I watch the choreographed activity! If you haven’t had the opportunity, follow a 3-6 year old child as they wander around outside. Watch to see what they find fascinating and attempt to see it through there eyes….some amazing things are taken for granted in this natural world around us….never lose the ability to see and appreciate the simple wonders around you. Post rain – the bees are slowly beginning to forage and defend the entrance. 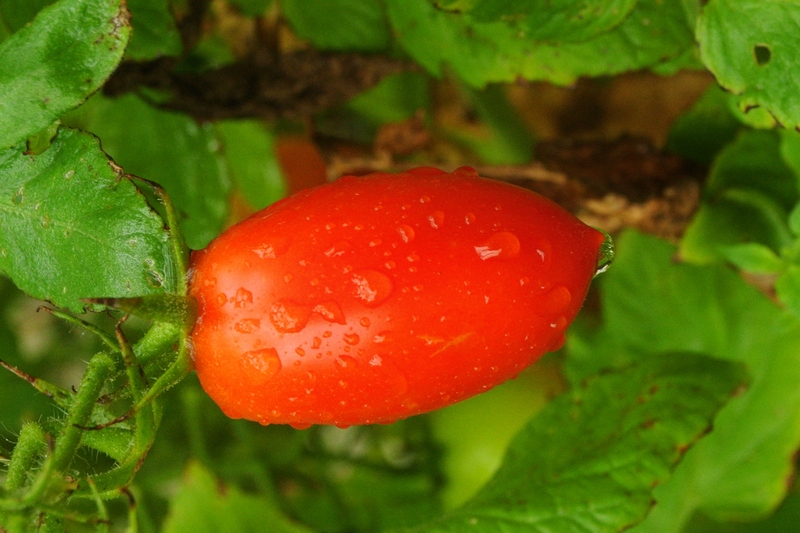 Snacks…My Juliet tomatoes are such a sweet snack. I picked a large number of the little cherry tomatoes and have about a dozen or more of the Juliets ready to be picked for the kitchen. Post rain they are so picturesque! Beads of rainwater still clinging to their skins and begging to be picked and consumed. Who am I to argue! Several found their way into my mouth! Small, probably 2 ounces, but prolific and tolerant of the Houston heat and humidity. 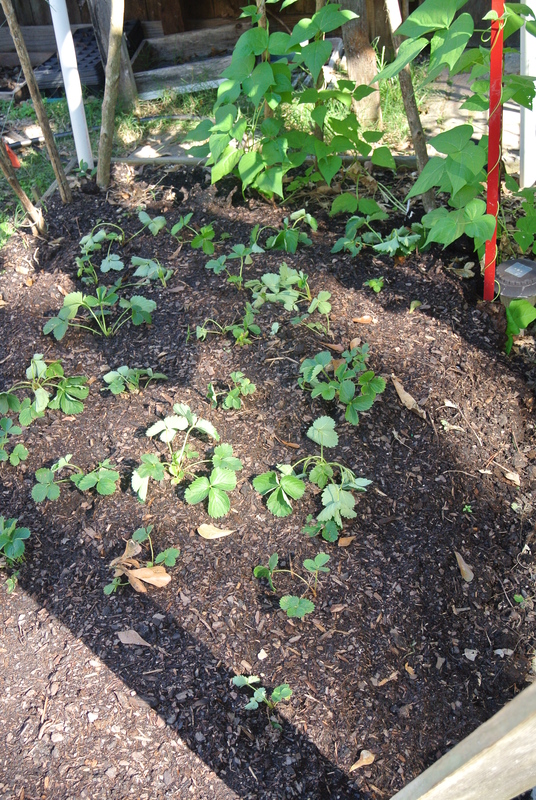 Going vertical….Cucumbers and yes, even watermelons. My pickling cucumbers succumbed to the nasty white flies….the Lady Bug beetles were working hard but not enough to keep them in check. I still have Straight Eight and Armenian type growing and beginning to develop fruit. I am growing a variety of small watermelons. A refrigerator type and growing them vertically. 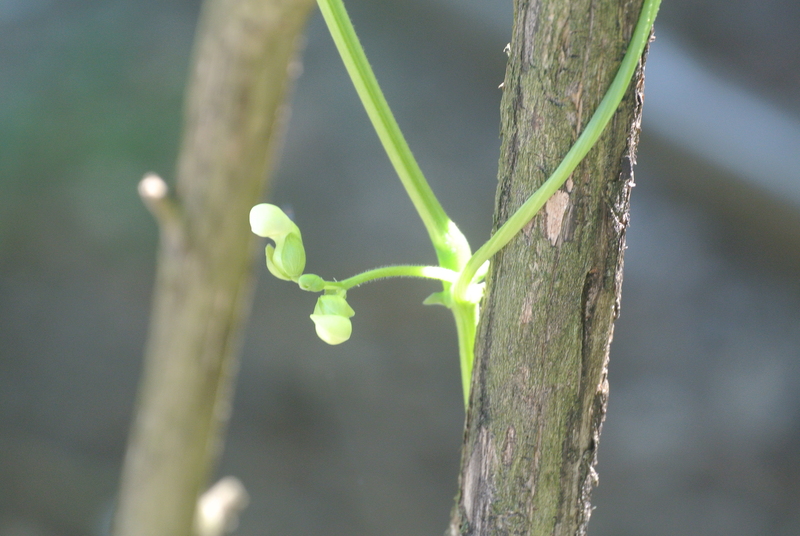 As the fruit develops I will have to hang a sling to keep them up off of the ground…..I can’t wait. In the background is a banana plant that should bear fruit next year. I met a Mexican worker on a pipeline job that I am supporting that gave me the corms. He grows many varieties of bananas in his yard south of Houston. It is an apple banana, Manzano Banana tree! Looking forward to harvesting! 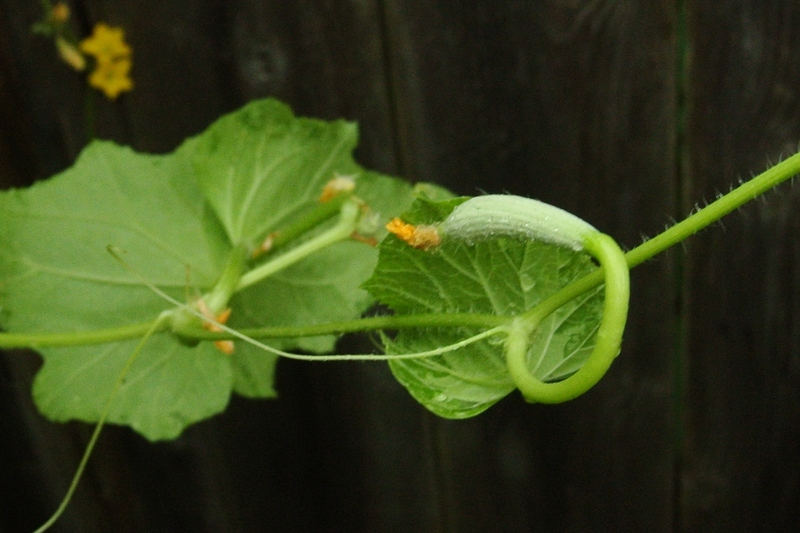 A developing melon. Full sized will be just a bit smaller than a volleyball. The vertical climbing vines with the banana tree in the background. I finally got a “round to it” handed to me concerning my worm farm. We have all used that phrase I am sure….”Yeah, I’ll get a round to it.” – But we never do…..I had a coworker who had a bunch made up – they look like wooden nickels and he hands them out to procrastinators…..I received one…what does that tell you about me? Yes, I fit the description! I harvested at least 10 pounds of wet worm poop and made several gallons of diluted worm poop tea! After spreading the gathered goodies I heard some “oohs” and “ahs” as the garden absorbed the delicious feeding! 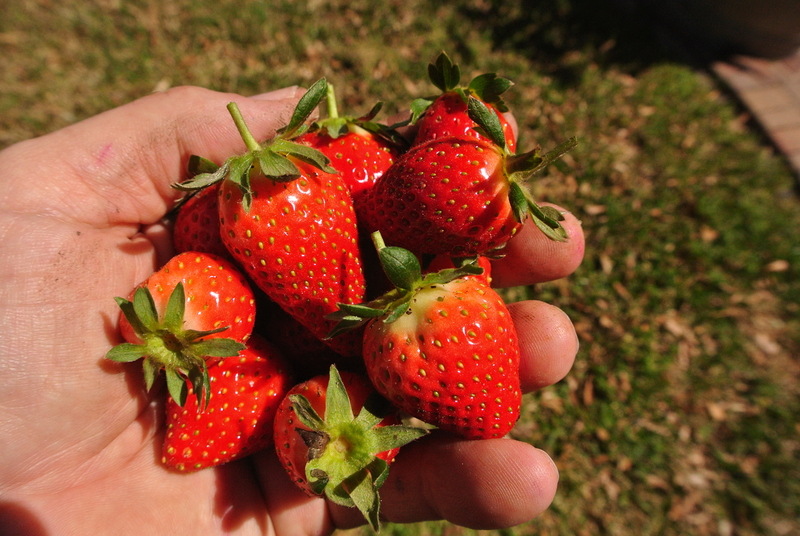 This morning I woke up on the green side of the earth rather than the under side……That was a good thing and made even better with a handful of fresh picked strawberries – <strong>Yee Haw</strong> – the strawberry harvest has started. I picked a nice handful of red, ripe, sweet berries. Once in hand the self-talk started. Should I share them? Should I eat every one of them before I get into the house? A bit of a dilemma for me. I didn’t share-(sorry Kathy) and I didn’t eat every one of them. The very best berries found their way into my mouth and several others started the frozen package being accumulated for the jam making later this spring. There is something so very special about berries picked at the peak of their flavor. That first berry I bit into caused a wonderful flood of true strawberry flavor and my mouth was overjoyed. A handful of Birthday Berries for me! 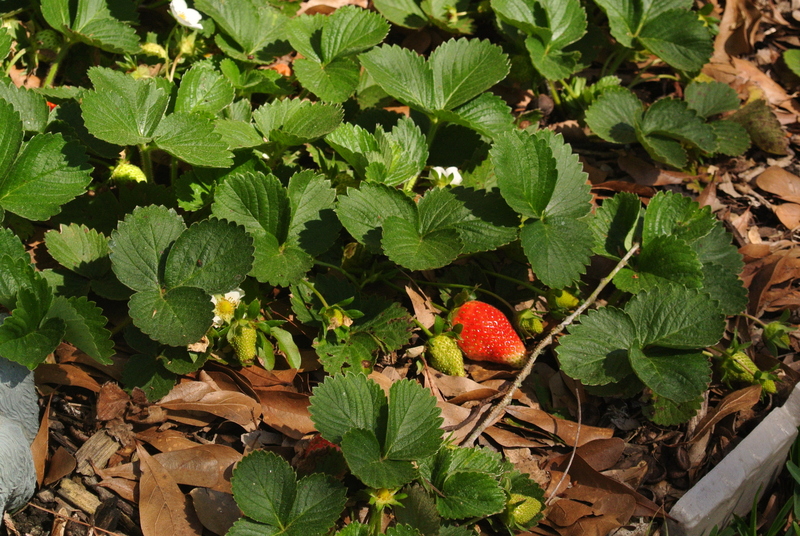 A healthy berry bed….more berries on the way! While wandering through the garden on this beautiful birthday morning I found a few early stalks of asparagus….Not enough to save for anyone other than the birthday boy. If you have never had asparagus picked and savored the freshest, you are missing the sweetness that is missing from commercially farmed and shipped from who knows where asparagus. My lemon tree is showing signs of blossoming soon. I can’t think of a flower blossom that is any more intoxicating than that of citrus. It is amazing how some scents and aromas can cause flashback memories. When my lemon tree blooms I am always transported to a late night motorcycle ride from UCLA down Sunset Blvd., to Will Rogers beach. That cool night ride took us through what used to be extensive citrus orchards before the land was converted to homes and estates. Fortunately many of the home owners kept the citrus trees, helping to fill the air the night with that intoxicating citrus blossom scent…..I said <strong>intoxicating</strong> before didn’t I! Let me dive into the Thesaurus! Intoxicating is a good word for the scent filled night air but…..there could be a stronger word or something better able to convey the sweet olfactory assault that created the enduring memory! How about “enthralling” – no, doesn’t capture the feeling/memory/brain recalled sensation. “stimulating” – not quite strong enough either. “Enchanting” – close. “ Exhilarating” – needs a little more to meet up with the sensations and emotions connected to the sensory memory . I’ll have to wave the white flag and give up on finding the perfect word….I will take any suggestions – English majors preferred! Just trust me…..it was an amazing memory. 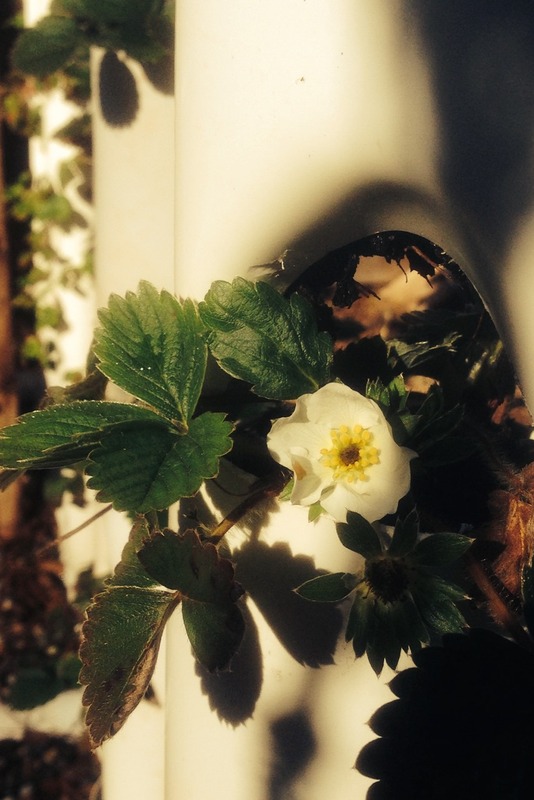 The strawberries are blossoming and the high achievers are beginning to ripen! You have seen my past posts on my strawberry towers and if you haven’t you can search going backwards in time. 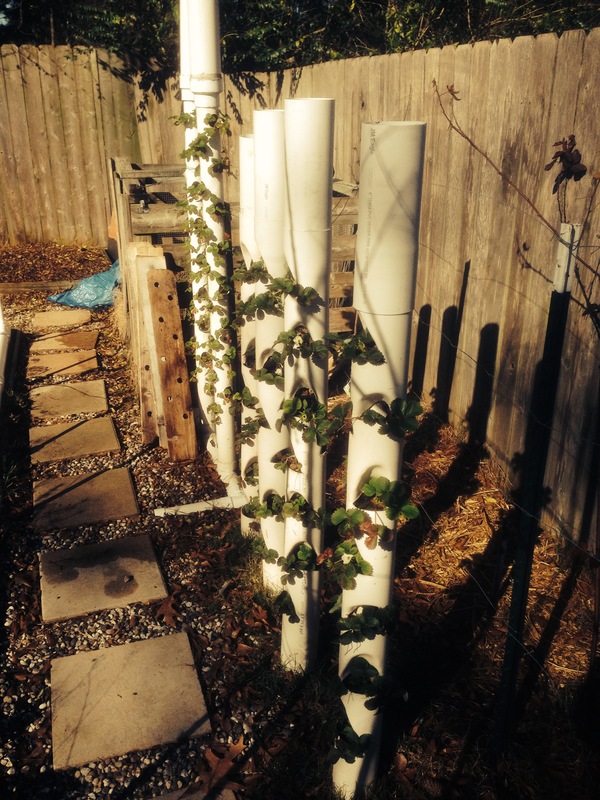 I have reloaded the towers with Chandler strawberries after adding a few more pockets to the shorter towers. My newest adventure with the leftover pvc from my youngest son’s Engineering project at Texas A&M University is shown below. I did have to buy a couple extra joints beyond the 12″ of 3″ pipe he needed but what the heck! 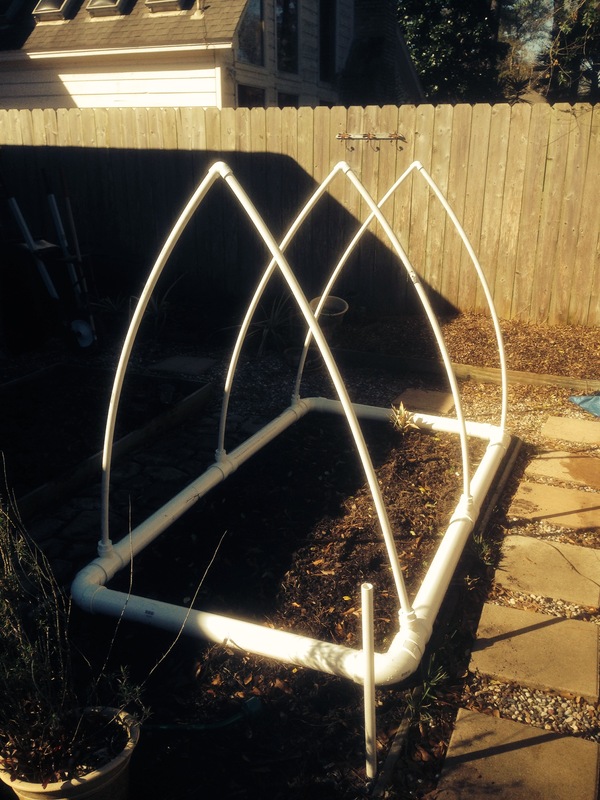 I have started construction on a mini greenhouse with the hope of getting my tomatoes off to an early start! Is it possible for me to have ripe tomatoes before May 1st? That will be my challenge! I enjoyed a misshapen strawberry today and the harvest is just around the corner…found a perfect berry today that is two maybe three days away from being perfectly ripe. I hope to share a photo and a tasting critique…..Unless of course my 4 year old garden helper from down the street comes into the yard and finds it before I can pick it! He is all boy and into anything and everything! Quick photos by my iPhone….I continue to be amazed at the quality of the images! Thursday Afternoon – We, my wife and visiting friends from Canada took a stroll down the 800 block of Linden Avenue in Carpenteria, California. The weather was perfect and our friends, Alan and Jan, seemed to enjoy the day. Below are a few shots I took as we wandered down the street, puntuated with stops at the brewery a few blocks away toward the beach and at the Cork Tree Bistro on the way back. It was a great evening. I wish I could get my heirlooms to grow this beautifully. Jan had the green striped variety with her lunch on the pier in Malibu. 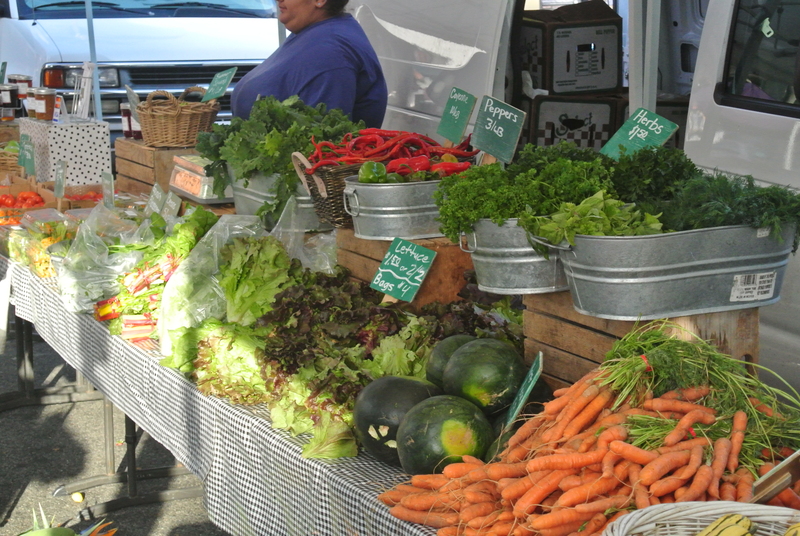 The colors and variety are a visual treat as well as nutrional treat. 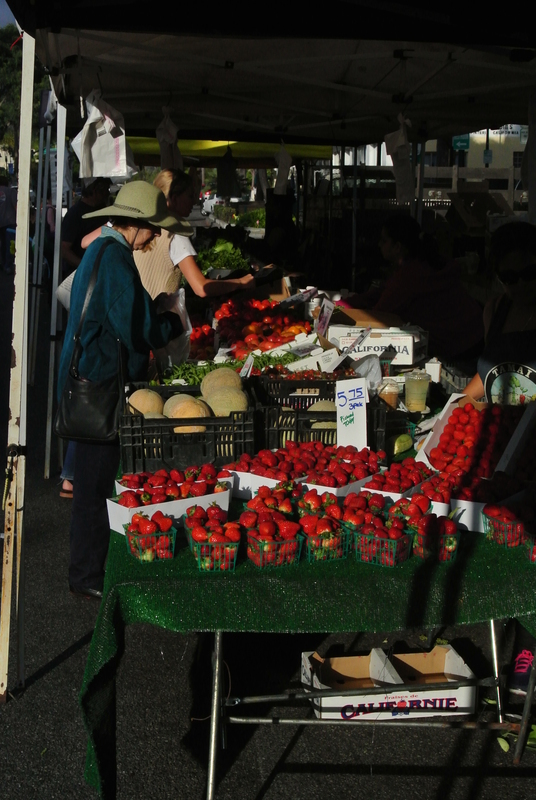 TTFN – Houston is cooling off but it will never match the weather in and around Santa Barbara!